Brussels Sprouts are a very interesting vegetable. If you have ever seen them grow, they have a tall stalk that protrudes out of the ground with giant leaves that flop out. In the mess of all this, comes the small Brussels sprout which gets no bigger than a golf ball at most. These little guys grow in the corner between the stalk and the leaves. All this hard work for this plant, just to grow a miniature cabbage. You sometimes see Brussels sprouts sold still on the stalk. They cut the leaves off, and what remains is a stalk full of these sprouts. When you buy it like this, you can really appreciate what it is you are eating, and where they came from. I love Brussels. They are probably one of my favorite vegetables; however, I do refrain myself from eating them all year around, otherwise I won’t be getting them local or organic, which is immensely important, not only to your health, but the environment. When they do come in to season in the spring and fall, we love making dishes with them. My favorite by far, is our Brussels Sprout Delight which is simply roasted Brussels and squash, or sweet potato, with garlic, butter and salt; so simply and easy, and my favorite method to date. On occasion we will try something different, in this case just blanching it and mixing with other roots and flavors. Brussels sprout salad is fun because you can change up the ingredients. In the past we have made a Harvest Brussels Sprout Salad which was quite tasty, but one thing about it was having raw Brussels. They can be quite tough when they are raw, and sometimes that is OK, but today we wanted to try something different. We blanched them just so, roasted the beets to bring out the sweet root flavor and added some walnuts and blue cheese because we just have to take advantage of the Autumn flavors. The mixture turned out quite tasty; a perfect mix up for Thanksgiving, Friendsgiving, or just any night during the week you don’t know what to make. Throw in some chicken and you have well rounded meal. It takes a bit of time to roast your beets, precisely 40 minutes, but the rest can be done during that cook time. Serve it warm if you’d like, or chill in the fridge for a bit. Any way you try it, these sophisticated flavors will have you coming back for more. Enjoy! Preheat oven to 375°. Place your chopped beets in a sheet of tin foil and drizzle with 1 T olive oil. Wrap up and bake in preheated oven for about 40 minutes or until a fork is inserted easily. Remove from oven and allow to cool. Meanwhile, prepare brussels sprouts (either using a sharp knife or food processor on shredding mode) and bring about 3 cups of water to a boil in a medium sized pot. Once water is boiling, add brussels sprouts and boil for about 2 minutes or until they turn bright green. Drain. 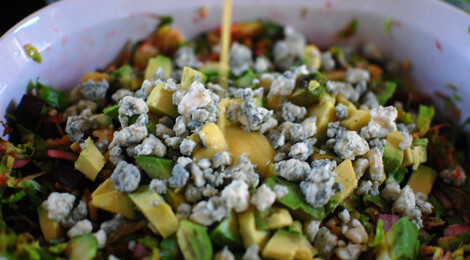 In your serving bowl, combine brussels sprouts, chopped avocado, chopped walnuts, crumbled blue cheese (or other cheese) and thinly sliced onion. Salt a bit and mix. Leave out the beets until last minute so your salad doesn’t turn pink. Mix your dressing by adding mustard, mayo, lemon, garlic and vinegar together in a small, separate bowl or measuring cup and whisk. Slowly pour in extra virgin olive oil while continuing to whisk until it turns creamy. Add salt and pepper to taste. 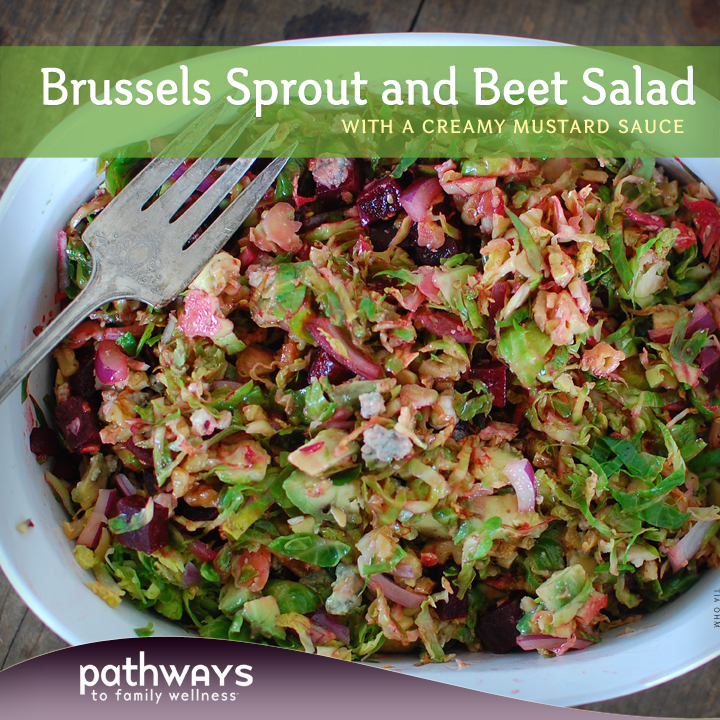 Add your chopped beets and dressing to your serving bowl with the brussels. Toss to mix and taste; add salt if needed and serve.